We’ve been hugely excited about Dark Horse’s upcoming Fire and Stone mega-event for months now, and the newest trailer for the series is only making it worse. Launching in September, Prometheus: Fire and Stone will kick off a multi-series shared storyline that will dive deep into the shared mythology of the Aliens, Predator, and Prometheus franchises. Those worlds have all been linked to varying degrees on the big screen, but Fire and Stone is set to explore the connections more thoroughly than ever before. If you haven’t already, check out the Prometheus: Fire and Stone trailer up top before we go any further. 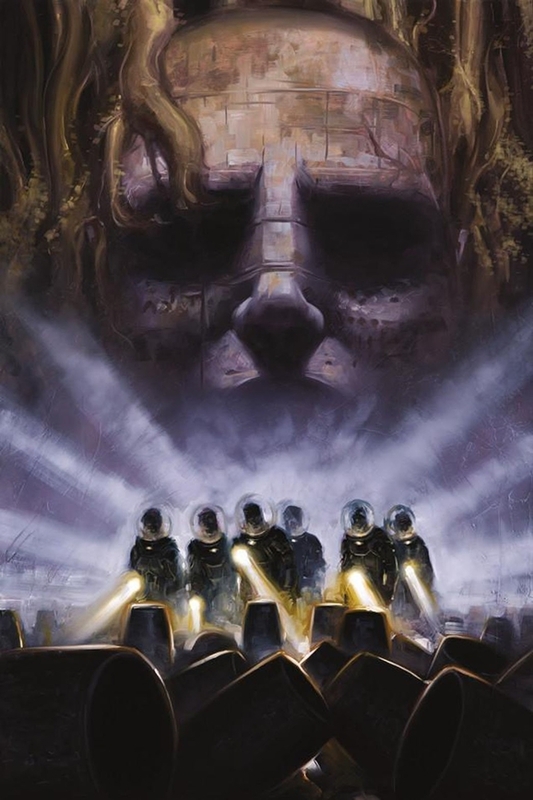 After the first issue of of Prometheus: Fire and Stone launches in September, the four other series will unfold with an issue per week, setting up an eight-week cycle of the Prometheus book, the Aliens book, the Alien vs. Predator title, and Predator: Fire and Stone. While each of the four series will have its own storyline, characters and events from each will overlap each other, creating a larger narrative structure that will culminate in a standalone wrap-up issue after they’ve all completed their runs. The idea of linking the Aliens and Predator universes has always been more exciting in theory than in practice — especially with the lamentable AvP movies — so hopefully Dark Horse’s Fire and Stone will be the chance to change that. It also strikes me that this is a bit like what’s happening to the Star Wars universe, albeit on a much smaller scale: an attempt to more tightly regulate the ways these narratives interact with each other, the better to tell a larger, more cohesive story. And let’s face it, it’s anybody’s guess when/if we might eventually see Prometheus 2 up on the big screen, and, depending on your thoughts about Ridley Scott’s film, that may be a good thing. Either way, I’m very excited to see Fire and Stone play out, and between this and the Alien: Isolation video game, this fall is going to be a great time to remind yourself that in space, no one can hear you scream. Prometheus: Fire and Stone hits shelves on September 10, with Aliens: Fire and Stone due out the next week, and the other two series to follow.